Nevertheless, it is the discovery of these skills that has proven most challenging. This is especially true for developers, who depend on the adoption of the skills they create to drive revenue. Indeed, the Alexa Skills Store offers users more than 70,000 skills to choose from. Complicating matters further is that many of these skills are similar, if not outright duplicates. In such a landscape it is often the case that users will simply download the option that they recognize first. In other words, winning the competition for skill recognition is critical. So, developers are always on the lookout for a leg up on their rivals. For their part, Amazon has done a good job keeping tabs on this issue. After all, a bad user experience with a poorly designed skill could inadvertently paint them in a negative light. For this reason, Amazon has a vested interest in promoting the very best skills available in the Alexa Skills Store, and giving developers the tools they need to promote their products. Writing for the Alexa Blog, Jennifer King provided 7 Tips on Promoting Your Alexa Skill. One of King’s tips caught our eye. Yup, you guessed it, number seven: “Promote Your Skill on Social Media.” This one is in our wheelhouse, so we wanted to take the opportunity to discuss marketing your Alexa skill with Facebook Ads. First, let’s start with the good news. Facebook has 2.27 billion monthly active users, and each one spends roughly 20-30 minutes browsing the platform per day. So, Facebook advertisements are a great way to get visibility for your Alexa skill. Furthermore, Facebook Ads leverages an increasingly mobile world. Unlike billboards, radio, television, and other traditional advertisement models, ads on the social media giant are not only visible no matter where your customers go, they also are significantly cheaper, reach much larger audiences, and are far more efficient. Without the right tools, Facebook Ads could cost your company a lot of money, and fail to put your advertisements in front of the people they were designed to reach. While a well-designed Facebook Ads campaign could do wonders for the visibility of your Alexa skill – and ultimately drive market recognition and revenue – a campaign that fails to reach your target audience could stunt your return on investment. In addition, when you consider the total investment that your company makes on an ad campaign, you must factor in not only what you spend on the Facebook Ads themselves, but also the time and effort it takes to conceptualize these ads, design them, draft them, approve them, etc. The very first step you should take when designing a Facebook Ads campaign is to develop a clear audience persona. This will enable you to put your ads in front of the people they were designed to reach. Facebook offers a host of tools to create such audience personas. They provide insight into their user base that includes everything from age and location, to personal interests and hobbies. So, in theory, one can use these to create highly targeted campaigns. Unfortunately, this is easier said than done. 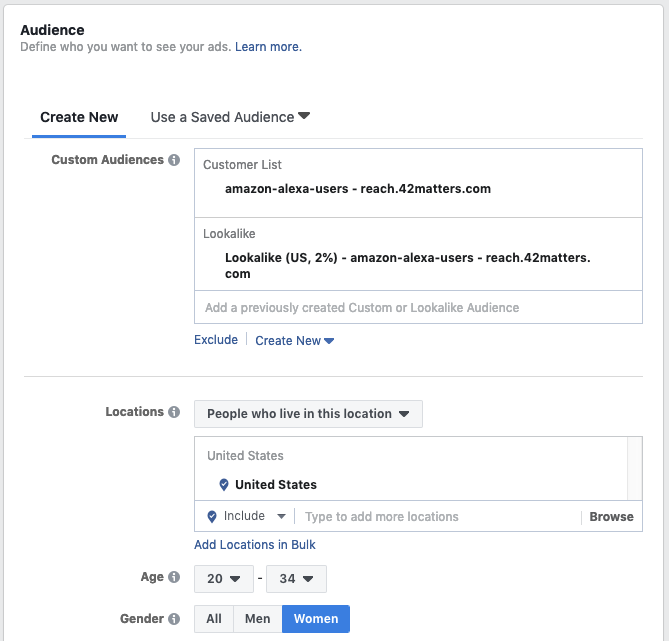 For instance, one obvious step for you as an Alexa skill developer is to use Facebook’s geo-targeting tool to focus ads on the countries where your skill has been registered for consumer use. You could also set the age and gender settings to match the profile of your anticipated user. Reasonable enough. But neither do much to refine your audience in any substantial way. Another option is to launch an interest-based campaign that targets folks who have “liked” the Amazon Alexa fan page on Facebook, as well as other pages, such as those for popular skills and rival developers. To that end, while somebody might “like” the Amazon Echo page, there is no guarantee that they own one, are in the market to buy one, or ever remember “liking” the page in the first place. This is where Audience Finder by 42matters comes in. As it turns out, you can tell a lot about people based on what they have on their phones. Indeed, you can learn so much that you can build an incredibly incisive audience persona by tapping into the applications that people download on their mobile devices. For instance, if somebody has downloaded the Amazon Alexa app, you can be fairly certain that they’re interested in maximizing the capabilities of their Alexa-enabled devices. Step One: Define Your Audience. You probably have a pretty good idea of what your average customer is like. And presumably, you have a good idea of who your competitors are. Use this knowledge to select applications that match this profile. Since you’re developing an Alexa skill, you should certainly target folks who have downloaded the Amazon Alexa app. Step Three: Create Your Facebook Advertising Campaign. Once you have exported your custom audience list from the Audience Finder to your Facebook Ads account, you are ready to finish setting the parameters of your advertising campaign. To define your audience as specifically as possible, we recommend adjusting any of the standard location, demographic, and interest-based targeting tools provided by Facebook. As mentioned previously, the obvious step here would be to focus on the countries where your skill has been registered for use. Since its initial release in 2014, the Amazon Alexa has triggered a whole new market for developers. In 2018 alone, the number of Alexa skills available in the Alexa Skill Store doubled. This has created an environment in which it is very difficult for developers to get visibility for the skills that they develop. The Audience Finder by 42matters can help boost your skill’s visibility by using information about downloaded mobile applications to more reliably identify your customers’ interests. This granular approach to audience targeting is guaranteed to put your advertisements directly in front of consumers no matter where they go. By using the Audience Finder in conjunction with Facebook Ads, you will be better positioned to reach your customers and drive the frequency with which they enable your skill on their Alexa app and devices. In addition, you will be able to outflank your less tech-savvy competitors and assure that the time and money you spend on advertising is fundamentally contributing to revenue. A detailed example to give you an impression of how highly accurate audience targeting works in comparison to traditional targeting options on Facebook. And also how it can increase the specificity of your Facebook ad targeting.